Are you taking your diamonds to the jewelry for a quick professional clean? Watch out for fake diamonds because it has happened if you’re not smart enough. The truth is, diamond switching practices are rampant were certifications are limited. You must not blindly believe the jewelry just because he is encircled by valuable baubles. Find out all the ways to avoid diamond switching whenever you’re buying diamonds! Did you know the diamond can get switched when you’re mounting or parting for the setting? Switching diamonds with lower quality diamonds of cubic zirconia (synthetic stones with high brilliance) is a serious crime called diamond switching. Simulants and synthetic spinel or even glass is a common form of substitution used when switching diamonds. To avoid the worst of diamond scams, you need to know how to pick up red flags and most importantly, what to do about it. Being smart about your diamonds is not hard. In fact, all it takes is basic diamond education to pass your test. That might take hours, but this blog post takes not more than 5 minutes to read. It has everything you need to know about popular diamond switching practices as well as how to avoid it! The first step to do when you’re looking for a diamond jeweler to clean, set or buy diamonds, you need to run the company through BBB. Better Business Bureau, Rappaport, and our own reviews show a transparent account of diamond scams on jewelers and diamonds sellers, individuals. Buy from 100% reputable jewelers and there are many, trust me! Mapping of the diamond inclusions by the jeweler you’re going to is crucial to assess if the diamond geezer is fake or real. Every diamond has distinct inclusions. They are the fingerprint of a diamond. You can also use the grading report or certificate to compare the inclusions of a diamond before and after jewelry rework. Every diamond certified by the GIA has an inscription number inside it. Remember to note it down at the jeweler. 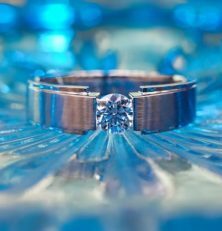 However, there are diamond sellers who add fake laser inscription on the diamond after switching stones. It is usually seen along the edge, easily readable with a loupe. I remember one of my aunts who received an heirloom quality diamond ring with 2-carat diamond on it. Unfortunately, she took it to a cheap jewelry who did the cleaning for free. When her daughter tested it after it was given to her, it was found to a CZ stone. Can you imagine the loss? Not just money, the sentimental value? So, always get your guarantee, but it is more vital to check the diamond before walking out of the store. Otherwise, the Federal Laws can work against you! Every jeweler must be accommodating if you request verification of the diamond you gave for cleaning. They must give you equipment to do so and if you feel dubious, ask about it before leaving your precious rock with a stranger. When they do give you the equipment, compare the inclusions. Another way of checking the diamond on your own is by getting a diamond tester pen, usually costing $20 and above. Get a good quality one and give every diamond and another semi-precious jewelry you have, a good test. Do you know there are gold tester pens too? Gold scams are prominent than diamond switching practices, see? I know it is a little bit pricey to get your diamond appraised again and again from a credible gemologist. However, if you doubt its authenticity, it is better you test it for sure sooner than later! Why do Jewelers Switch Diamonds? You must understand that it is a very small proportion of people who switch diamonds. Today, we have multiple regulations and safety standards in place to avoid such scams. Moreover, it is difficult to see a jeweler risk the total reputation for years to come for a small rock. Do you know most diamond jewelers see thousands of exception diamonds throughout their life? That being said, a little bit of precaution doesn’t hurt. I carry my diamond pen wherever I go to buy diamonds. I’m anxious and hate doubts and suspicions. I suggest you do the same for peace of mind and value! Diamond switching is not an unseen practice, but if you are careful, no one can fool you. Do you know it happens the other way too? Here’s the video of a man switching a fake with a diamond at a jewelry store!